15 agents have died from cancers linked to their roles in the investigation of the attacks, three of them in the last six months. Robert Roth was one of those 15 agents. He was working out of the FBI's Washington Field Office and raced to the Pentagon to assist with evidence recovery. His widow Tresa said her husband never thought about the dangers of entering the crash site. "I don't think anybody had on hazmat gear, it was such a sense of immediacy," she said. "Everyone hurried there. They just wanted to get to work so nobody wore hazmat gear the first day." Even with protective gear, she says Roth didn't feel right. "Bob would remark about a burning in the back of his throat, a metallic taste in his mouth, those sorts of things," she said. Roth died six and a half years later, after the cancer attacked his bones. As she sees more of her husband's former colleagues getting sick, Tresa Roth wonders if it will ever end. "We have forged ahead and I've tried very hard not to be bitter about any of it," she said. "It does seem to be a continuous ripple in a pond that things have not come to a conclusion." Dawnele Holbrook was working out of that same Washington FBI office on a counterterrorism squad assigned to sift through the wreckage at the Pentagon. An avid fitness buff, Holbrook says her body started to break down in 2013. "I used to run daily, I ran a marathon in 2012," said Holbrook. "And then all of a sudden, I couldn't run. I couldn't breathe." Holbrook was eventually diagnosed with non-Hodgkin's lymphoma. She says she's reminded of 9/11 during every cancer treatment. "I will deal with it the rest of my life," Holbrook said. "It's not just myself, it's worrying about friends and co-workers." Dr. Sudeep Menachery, Holbrook's oncologist, said the emergence of more 9/11-related illnesses over the years span doesn't surprise him. "I think that we're sort of on the brink of seeing more cancers in 9/11 related exposures," Menachery said. 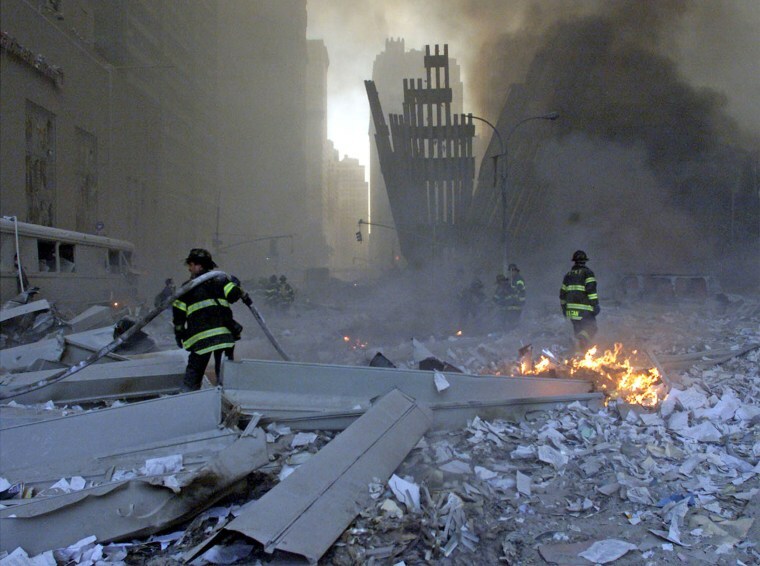 Scott McDonough was in an FBI helicopter that hovered over Ground Zero for weeks taking evidence photos. "The most acrid, pungent, awful smell you've ever smelled" is how he describes it today. "We would fly over Ground Zero and over the Fresh Kills landfill at very low altitude, flying through the dust clouds and debris that was airborne," he recalled. Last year, McDonough was diagnosed with colorectal cancer. He says he is disease free after surgery and chemotherapy and wants his fellow agents to know help is available. FBI Deputy Director David Bowdich is urging all of the agency's first responders to follow McDonough's lead. "What I would tell all of our employees that did respond or did work on these endeavors to make sure that they get checked. Make sure that they spend time listening to their body and ensuring that they make their annual checkups," Bowdich said. "Don't be rough and tough." Bowdich encourages all first responders to get registered with the World Trade Center Health Program, which provides medical support to any individuals whether they are sick or not.